North Korea's leader Kim Jong Un watches a military drill marking the 85th anniversary of the establishment of the Korean People's Army (KPA) in this handout photo by North Korea's Korean Central News Agency (KCNA) made available on April 26, 2017. TOKYO – North Korea has taken another bold step toward achieving its stated goal of being able to send a nuclear weapon to the U.S. mainland, firing an intercontinental ballistic missile late Friday that highlights the regime’s rapid technological progress. 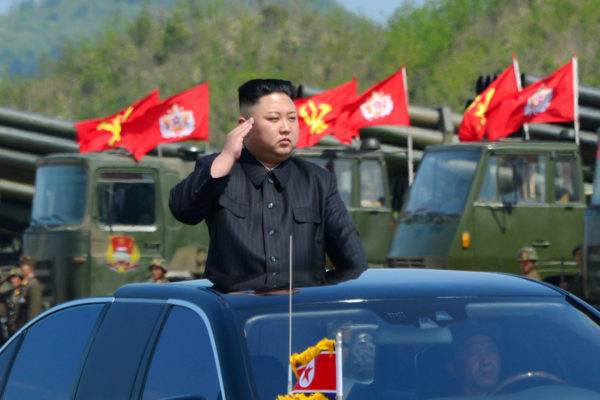 “Kim Jong Un does seem hellbent on acquiring the capability to reach the United States with nuclear weapons,” said Sharon Squassoni, director of the Proliferation Prevention Program at the Washington-based Center for Strategic and International Studies (CSIS). The Pentagon’s Defense Intelligence Agency has shaved two full years off the forecast for North Korea’s ICBM program, now estimating that North Korea will be able to field a reliable, nuclear-capable intercontinental ballistic missile as early as next year. The North Korean leader has repeatedly said he wants a nuclear-tipped missile that can reach the United States, and his defense minister Wednesday threatened to launch a preemptive nuclear strike against the United States. The Pentagon is planning another test of its Terminal High Altitude Area Defense missile defense system in Alaska soon. The system is designed to shoot down incoming missiles. The United States has been leading the charge for more and more sanctions against North Korea, but Russia and China – both veto-wielding permanent members of the U.N. Security Council – have been reluctant to impose painful measures and are calling instead for a “de-escalation plan” to deal with Pyongyang. The Washington Post’s Thomas Gibbons-Neff in Washington contributed to this report.